Betfair is responsible for creating what are now some of the staple features of online gambling. Cash out? Betfair. In—play betting? Betfair. And do we even need to mention the Exchange? Bursting onto the scene in 2000 and ruffling a lot of feathers as they did it, Betfair has brought innovation and excitement to the gambling community like no one else before them, although interestingly, it wasn’t until 2012 that the Sportsbook was introduced. It’s certainly here now, though, and offers sporting events in numbers that few can rival, with market depth to match. 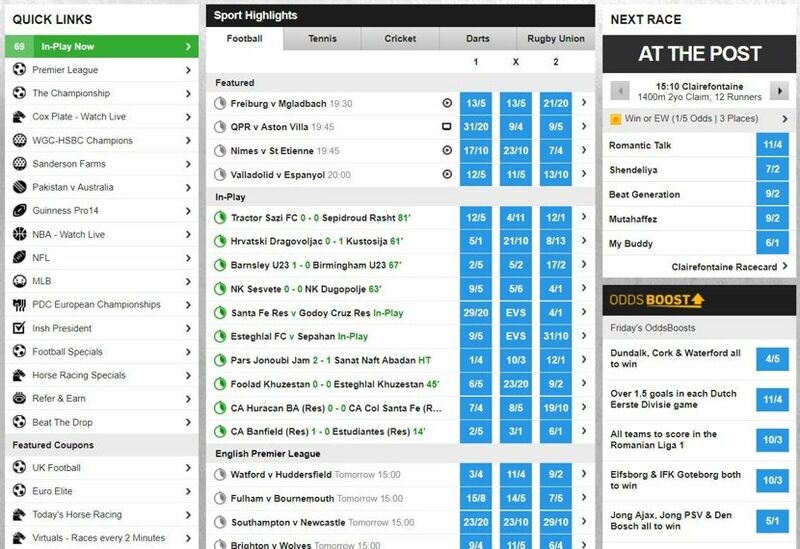 A tonne of features and promotions on the side makes Betfair a real destination for the casual and professional gambler alike, arming them with everything they need for a rewarding betting experience. In less than 20 years, Betfair have not only established themselves as a market leader, but as a market influencer. Known for giving great odds on a whole range of markets (fractional or decimal), including futures, Betfair is the first choice for many the intrepid bettor. Features such as Price Rush – where you are subsequently given odds better than the ones you took – and Acca Edge – where you get your stake back if the Acca falls short by one – ensure plenty of value for customers, and an incentive to stay loyal. They tend to be good for daily Odds Boosts too, and we haven’t forgotten the Exchange – we will cover that later. They are big on promotions in general, especially when big sporting events are coming up, so make sure you keep your eyes peeled and take advantage. They tend to have their fingers on the pulse here. 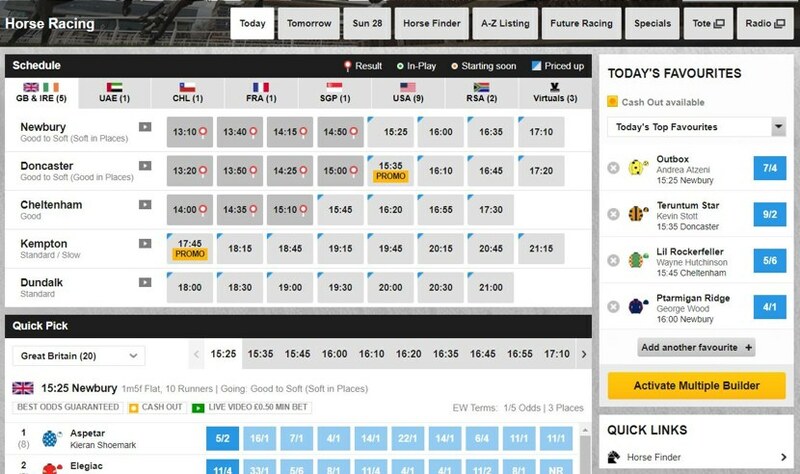 Those who bet on the Horses will be pleased to know that Betfair cover races globally with most of them streamed live, and the range of betting options within that is huge. Tote betting is a welcome feature and their very own Timeform radio will keep you up to date with the latest news and results. Best odds guaranteed make us all warm and fuzzy inside and there are also plenty of opportunities to bet on the Greyhounds. We could go on forever about the range and depth of events and markets, you could get lost in it all, and if you take the Exchange into account the numbers really start to stack up. Needless to say, Football, Tennis and Horse Racing get a lot of attention, but Chess, Current Affairs and Gaelic Games are also on show in good numbers, and even the Specials throw up a few unlikely choices. More popular events can boast hundreds of markets but even the Badminton will have a good 30+. Live Streaming access requires nothing but funds in your account, although to watch the horses you will need to have wagered a minimum of 50p, which is understandable. Any event that is available for streaming will have an obvious icon next to it, although the Horse Racing live stream resides in its own separate area of the site since pretty much every race is available to watch every day. If the event you like the look of isn’t available to stream, you will see a match graphic or simply the current score. Considering Betfair invented in-play betting this isn’t always as interesting or impressive as at some other bookies, even some of the smaller ones, but each event is delivered on an interface that is great to use, showcasing the range of markets within the event in a clear and well organised way. This includes stats for each event if they are available, both for the current game and recent history. On average you should find a good 100+ events to bet on even at quiet times of the day or night, from Football and Tennis to E-Sports and Handball – plus all of the horses you can shake a stick at. Betfair live up to their name when it comes to banking, offering punters plenty of choice as to how to deposit and withdraw funds, and not charging them a fee to do so. They also aim to process all withdrawals at their end within 24 hours. If there is an online bookie as feature rich as Betfair then tell us who, because we haven’t found them. Seemingly every angle is covered, and most of their features even have features of their own. We have mentioned a few already so for fear of breaking the internet we won’t go into them in further. Suffice it to say, this really is a haven for all things gambling. The Exchange was where it all started for Betfair. An innovation that allowed bettors to place wagers between each other rather than with a traditional bookie, essentially making the customer the bookie. Without being dramatic, Betfair operates the best Exchange in the world, and at one point it was estimated that 90% of peer to peer business was handled by Betfair. It is encyclopedic in scale with a staggering amount of content, as well as features such as Tips & Features, a Forum, an insane amount of Historical Data (subscription service with a free option), plus an area called Learning which teaches you how to use the Exchange. This is where the professionals go to hunt, but don’t be intimidated; with a little knowledge there are endless opportunities to make money in the Exchange. There are 7 sports to bet on when it comes to Virtuals: Horses – Jumps, Horses – Flat, Football, Greyhounds, Speedway, Motor Racing, and Cycling. Graphically we are in a good place, somewhere around Fifa13 we would say, and new events start every 2 or 3 minutes. The commentary can vary depending on sport – the Football is good whereas the Motor Racing doesn’t add much – but you can mute it if you hate it. It’s as good as any you will find elsewhere, and some of the names can be a giggle – the Mersey Blues playing at Odd Trafford anyone? 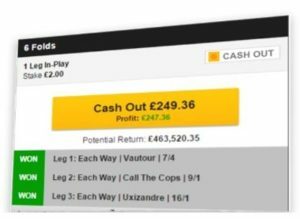 Look out for the orange Cash Out button on your betslip, as this could be the key to making a profit while the going is good. Betfair allows bettors to settle their bets early if they get the jitters or change their minds on the outcome halfway through a match. This means you could still make a profit (albeit a smaller one) and eliminate the risk. This option adds excitement to any live game, and is a regular option with Football, Tennis and Horse Racing events, among others; just make sure cash out is available before you place your bet. It isn’t available on ante-post bets or on enhanced odds, for example. The same premise as regular cash out except your stake is split. So, you might choose to cash out £5 of a £10 bet at the current cash out price, but leave the other £5 in at the price you initially took. This allows even greater control and flexibility on the bettors part, and depending on the ups and downs of the game or race you are betting on, could also net you a tidy profit or save you from a huge loss. You can do this as many times as you like throughout an event provided that the cash out meter is still available. Although named Football Jackpots you can also bet on Horse Racing, Tennis, NBA and NFL in this section of the site. Put simply, this is pool betting with a Betfair twist, and a jackpot prize as well as consolation prizes at the other end. 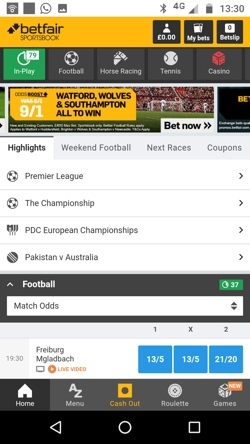 The punter bets a fixed stake into the pool and then makes their selection/s, with the pool ultimately being divided between those who choose correctly. Jackpots can hit the multi-million pound mark so it’s no joke. Pool types include 1×2, Correct Score, Asian Handicap, Over/Under, BTTS, Point Margin, Win, Place and Finishing Order – depending on the sport, of course. If this all sounds confusing, take advantage of the Smart Pick tool for your first few goes until you get used to it. There is even cash out available. We get it, most of you sports fans probably don’t play much bingo. But perhaps your Nan does and you went along with her once or twice for moral support and caught the bug. It’s ok, we won’t tell anyone, and you will be in good company at Betfair. If you have brain ache after an hour in the bowels of the Exchange, relax and settle in to one of the many bingo rooms available, playing both 75 and 90 ball games with ticket prices ranging from 1p to 25p. Each room has an internal chat window and there are a good few promotions to be had plus a rewards scheme. Alongside the traditional Casino, Betfair also provides players with a Live Casino and a Poker product. There is no chance of you missing them either because they are plugged with annoying frequency on the Sportsbook. 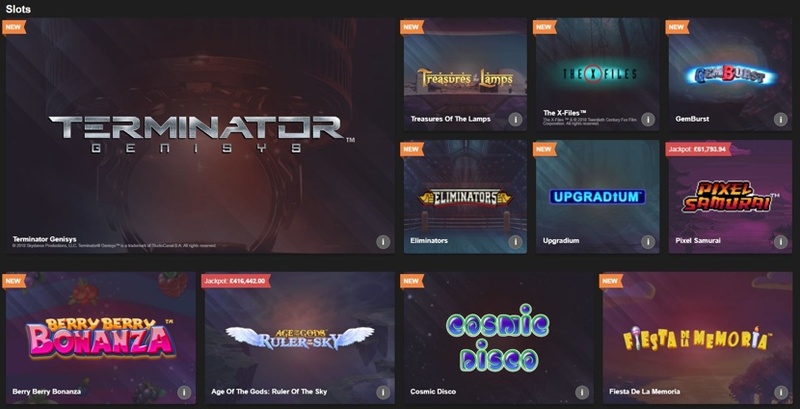 The Casino itself is powered by Playtech and offers 150+ games from this provider, whereas more games from other providers can be found in the Vegas and Macau sections of the site. The Live Casino covers a good range of traditional table games and allows you to watch and interact with the dealer via live stream. It is also available as a download if you would prefer to have it running in the background. Our full Casino review is right over here. This is definitely a site more focused on getting the job done than looking good doing it. Which isn’t to say that it’s badly designed, it’s just not flashy and sleek like some others are. It does feel a little dated in the way that the menu options are presented in grids and blocky buttons, but it works, and more importantly, it is jam packed with features. Because the site is so vast, each section is tailor made. For example, if you select Horse Racing, then as well as all of the odds etc you will also see a link to Horse Racing Virtuals plus quick links to the next race and a list of today’s favourites. In the Football section, there is a scrolling Match Updates box so you can keep half an eye on the other games that are currently taking place. These little features really add to the betting experience and make it easy to act on impulse and jump from one bet to another. 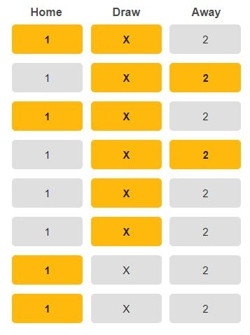 The layout of available markets once you have chosen an event to bet on works particularly well, offering stats alongside to help you make your decision; and handy box’s like Odd’s Boosts keep you informed of daily specials you might want to nab. The interface works quickly and navigation shouldn’t be an issue in itself – the sports categories are easy to spot as are your account and banking areas – it’s more likely that you will be overwhelmed with choice initially. However, it won’t take long to get the hang of, and your betslip will stay tucked out of the way until you need it. 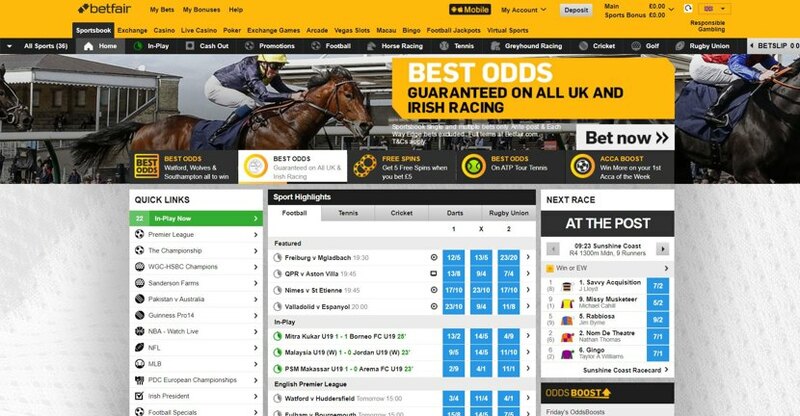 It all runs on the OpenBet platform which claims to process more than 2 billion bets every year (half of them could well be via Betfair), and the fact that Betfair has been using this platform since the beginning tells you all you need to know about their quality. The mobile site is just as busy as the desktop site in terms of what’s available, but the small screen layout actually makes it even simpler to take everything in, and the interface easier to navigate and control. Naturally, it will perform strongest when used for one particular sport or event, whereas the desktop site comes out on top if you are wanting to monitor more than one thing at the same time or get knee deep in stats. The whole thing is portioned off to keep things running smoothly, so to get from the Sportsbook to the Exchange, or from the Virtuals to the Football Jackpots, you will have to go via the A-Z menu and then that particular section will run independently. Think of it like 5 or 6 different websites holding hands. This all makes it sound far more complicated than it is – in reality everything is a mere 2 taps away – and it reacts beautifully. Back to the Sportsbook then, and everything should be just how you left it on the desktop site. There are easy links to each sport, live streaming is available, a cash out button is ever ready for those moments where seconds count, and we loved how a placed bet floats up to be added to the betslip. This is solid work from Betfair. These days, the name Betfair is as synonymous with sports betting as the likes of William Hill or Coral. Unlike these other big guns, though, Betfair has only been around since the year 2000 when it was founded by Andrew Black and Edward Wray, offering something a little different in the way of a betting exchange. In less than 20 years they have become the biggest betting company in the country, and the largest betting exchange in the world. They wasted no time getting started, becoming the first bookie to sponsor an English football team (Fulham in 2002) and launching their own radio station 4 years later, when they were valued at £1.5 billion at only 6 years old. This from the company that held a mock ‘funeral’ for the traditional bookmaker at their own launch party. Cheeky or what? 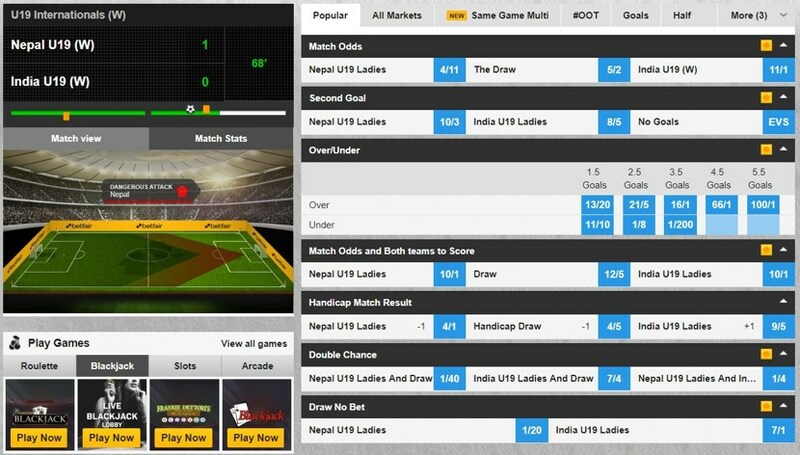 Although they did eventually add a traditional sportsbook to their repertoire in 2012 to compete with traditional bookmakers. At their peak they employed 2,300 members of staff (now down to 1,800), and claim to have over 4 million customers worldwide turning over a cool £50 million every week. Although wildly successful, Betfair has faced plenty of controversies, the first incident coming in 2008 when the company effectively punished successful punters by introducing a premium charge on winnings over a certain amount. Issues with data theft, in-play betting concerns, illegal dividends, and sports integrity matters followed. They also moved some of their operations to Gibraltar in 2011 to save on tax. None of this seems to have stunted their growth, however, and by early 2016 Betfair had agreed a merger with Paddy Power – another bad boy of the industry some might say – to create Paddy Power Betfair PLC. Professional bettors who really know their stuff will find plenty to love in the Betfair Exchange, and could make good use of the stats and tools on offer there. Those who enjoy more traditional events such as the dogs will also feel at home. Horse Racing fans are extremely well catered for, and a lot of care and attention has gone into this sport in particular on the Sportsbook. The range of events and markets in general, however, is a shining example of how to give the customer variety. The great thing about Betfair, is that even if you aren’t a seasoned gambler the site is still easy enough to use since the more complicated features are all tucked away under their own tabs. So they are there if you want them, but they don’t need to bother you if you don’t. Betfair customers can speak to the team using seemingly every communication method in existence apart from smoke signals. The standard rate phone line and dedicated Twitter support account are standout options that a lot of other bookies can’t or don’t provide, and neither are token gestures; they are both manned late into the night. Plus, the FAQ is packed with detail and fully searchable by keywords. Sending an email allows the team to prioritise their replies, so chances are you will get the most thorough response using this method. The Live Chat works great and feels personal since your operator’s name is given, but it is a little bit long winded to access. This is because the Help section of the site that contains all of these options is actually hosted on a separate site altogether, so in effect, the wealth of information and assistance available to punters is the very thing that causes it to be a slight chore to find. It’s hardly a sticking point though; you won’t struggle to get help, it will just take another window in your browser and a bit of extra clicking to get there. Live Chat – It’s there but it’s tucked away inside the Help section on the homepage, and from there you need to select Contact Us then click any topic to get the Message option. Available 24/7. Email – A good option if it isn’t urgent, info@betfair.com should get you a timely response. Phone – The line is manned 7.30am – 12.30am and the digits you need are 0344 871 0000. 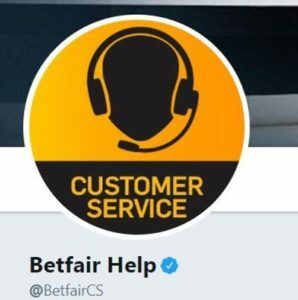 @BetfairCS – The cs stands for customer service, and this dedicated account nails it. Active, responsive, and lively. Check @Betfair for promotional offers and news etc.